Turns out this isn’t a Baird’s Please see the correction. 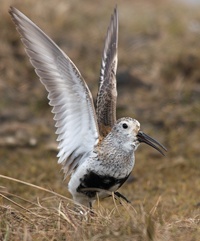 WC overlooked a sandpiper species when working through the long list of sandpipers that breed in Alaska: Baird’s Sandpiper. Baird’s move through the southern two-thirds of the state en route to their high arctic breeding range. Like the Pectoral Sandpiper, the darker feathers end half way down the chest, but tend to fade out, rather than a sharp transition. But you can tell them apart by the black legs, in contrast to the yellow legs of a Pectoral. One of the most remarkable characteristics of Baird’s is that it makes one of the largest metabolic investments in egg production known in birds. In a stunning feat of energy conversion, the female lays a clutch that is up to 120% of her body mass in just 4 days, shortly after arriving in the Arctic, with essentially no stored fat. When you understand some Baird’s migrate from as far as Tierra del Fuego, it’s even more astonishing. Sorry to have overlooked this remarkable species.